平常香港人去新加坡食胡椒蟹, 基本上離唔開 Jumbo! 係好食既, 不過係比遊客食 lor…老闆上次試過小紅樓, 話今次要帶我試試, 同 Jumbo 比較一下! 一上菜就知好過 Jumbo 好多啦, 我個人喜愛偏乾身無乜汁的! 醉蝦, 勁好味! 酒精敏感的我都飲晒碗湯, 蝦非常爽口彈牙, 湯清甜! 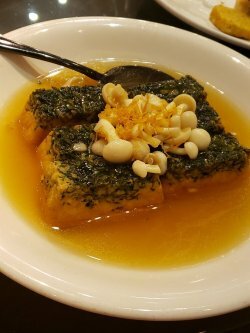 Spinach Tofu ~ 呢個好食! 好幼滑既豆腐包粉, 沾紫菜炸, 再用上湯燴, 必點! 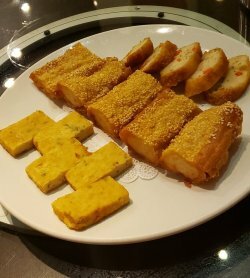 Jumbo 都有呢味餸, 用上玉子豆腐比較滑, 但小紅樓呢款食落口會比較實在!最期待當然係胡椒蟹, 肉質厚而實淨, 不過蟹蓋完全無蟹糕! 蟹鉗卜得唔夠碎, 無咁入味仲有 d 難鉗! 個胡椒汁好香, 都係有種磨菇味, 但又未至於食到停唔到口! 炸物拼盤, 有墨魚滑釀油炸鬼, 豆腐, 蝦餅! 爽口彈牙, 不過無乜特別! 炸雞更是失色之最! 最後食埋個甜到漏的芋蓉銀杏甜品, 飽到一個點! 平常香港人去新加坡食胡椒蟹, 基本上離唔開 Jumbo! 係好食既, 不過係比遊客食 lor…老闆上次試過小紅樓, 話今次要帶我試試, 同 Jumbo 比較一下! 一上菜就知好過 Jumbo 好多啦, 我個人喜愛偏乾身無乜汁的! 醉蝦, 勁好味! 酒精敏感的我都飲晒碗湯, 蝦非常爽口彈牙, 湯清甜! 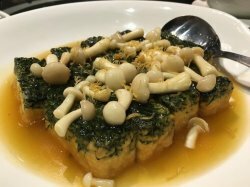 Spinach Tofu ~ 呢個好食! 好幼滑既豆腐包粉, 沾紫菜炸, 再用上湯燴, 必點! 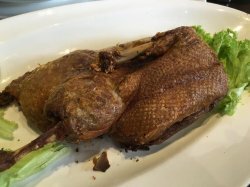 Jumbo 都有呢味餸, 用上玉子豆腐比較滑, 但小紅樓呢款食落口會比較實在! 最期待當然係胡椒蟹, 肉質厚而實淨, 不過蟹蓋完全無蟹糕! 蟹鉗卜得唔夠碎, 無咁入味仲有 d 難鉗! 個胡椒汁好香, 都係有種磨菇味, 但又未至於食到停唔到口! 炸物拼盤, 有墨魚滑釀油炸鬼, 豆腐, 蝦餅! 爽口彈牙, 不過無乜特別! 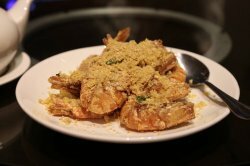 we ordered cereal prawns 400g at S$7/100g. this was really good too. crabs were priced at S$72/kg. 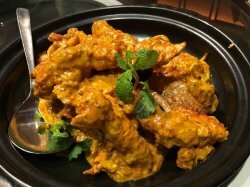 we ordered a small sri-lankan pepper crab, 800g for S$58.this was a red house signature dish, and it was very good! 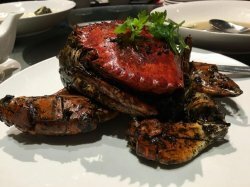 the 苏格兰面包螃蟹 (similar to dungeness crabs at pier 39 san francisco, also a common crab dish in hong kong & china seafood restaurants) was priced at the same S$72/kg. it’s 1.2kg so S$86, quite a bit more expensive. 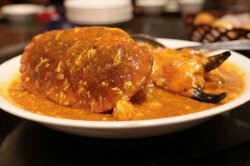 this also red house signature dish. the crab meat was quite solid & more firm than sri-lankan crab. also the chilli sauce was quite poor really, quite sweet but not intense with meat sweetness, instead gluey, sweet not spicy, more like a tourist version. this crab had a lot of roes & tomalleys. the 3-egg spinach also very good. 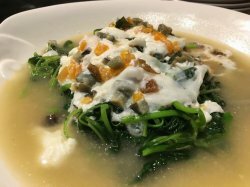 but really this 3-egg spinach dish the best i had was at uncle leong jurong east. 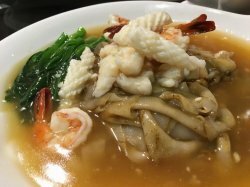 we ordered a medium seafood hor fun. it was pretty good. several friends commented good wok hae! the broad kuay teow was especially flavourful. 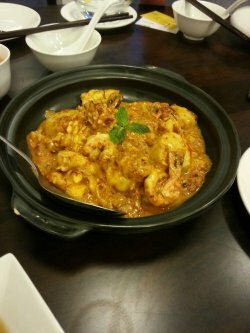 & the serving had quite a bit of prawns & sotong. it was a good round-up dish for the dinner. 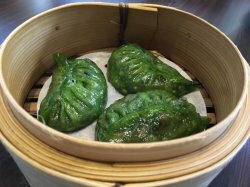 a friend bought lunch at red house princep street on 26.4.2016.
friend ordered the steamed bamboo clams 圣子. 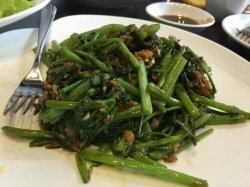 dish was ok. this a bit small c/w say ah yat or jumbo or long beach, quite similar size to the recent ones we had at tunglok signature orchard parade, but tunglok’s minced garlic oil & tanhoon a lot tastier than this. the 杨枝甘露 looked average.the orh nee 芋泥 didn’t looked right. maybe taste was ok? Not Too Fantastic Dim Sum but Good Service! 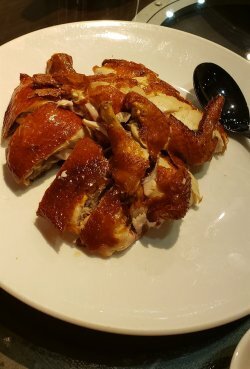 I was walking past Prinsep Street one afternoon and I realize there's a new Chinese restaurant which pop-up along the stretch where it is well-known for bars and gamers to hangout at the nearby LAN-gaming store. My colleague and I decided to drop by to try out their dim sums since we were craving for some piping hot steam buns. 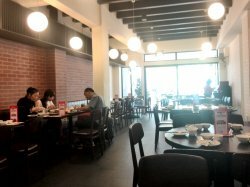 Being here for the first time, I felt the restaurant was very clean, bright and spacious but a pity it was very empty during lunch hours. I guess the office crowd must have went to dine at cheaper alternatives in the vicinity like Sunshine Plaza and Peace Center. 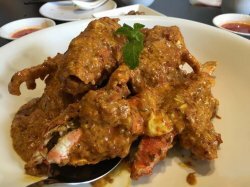 Besides our table, only 2 other tables were spotted eating their signature dish, Black Pepper Crabs. 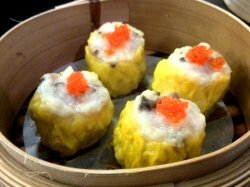 I always love Siew Mai ($4.80 for 4) with my favourite mushrooms and prawn roe so we ordered a basket of it. After taking a bite in it, to my surprises, there was a shrimp in it too. The sweetness of the shrimp and mushrooms adds to the flavour of the juicy pork meat. 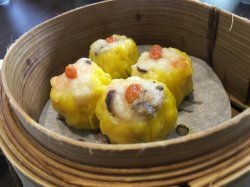 Topped with prawn roe, it was a chewy experience popping them in my mouth. I quite enjoyed this as it has a modern touch to it. 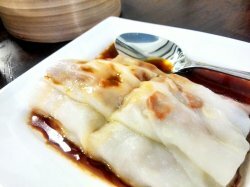 I have always like Steamed Cheong Fun with Char Siew ($5.00) since I was a kid. 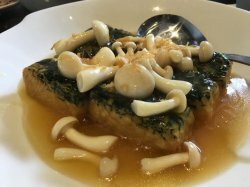 It was quite disappointing when the dish was served because the layer of the rice flour looks dry and thick. Taking a bite into it, the char siew was tough to the bite but thankfully for the sauce, it was the saving grace for this dish and also help to add a light, savoury flavour to the cheong fun. I would have prefer the rice flour to be thinner and smoother which will be perfect! 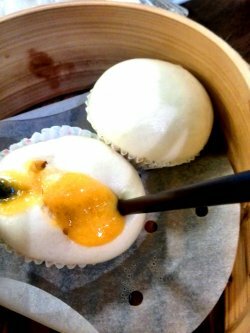 How can I not have the Steamed Custard Buns ($4.20 for 3) when it is shouting to me on the menu "try me!". It came in a basket of 3 and I couldn't resist poking it with my chopstick for the custard lava to flow out. Yippeee...!! It passed my poking test! 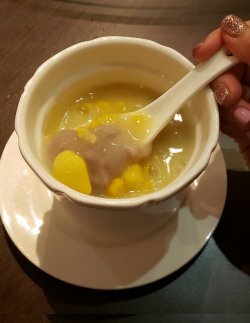 Coming to the taste, the custard wasn't too overwhelming and the flavour of salted egg was subtle, perfect for those with a sweet tooth. It wasn't overly oily like some other places and I thought it was decent for me. However, for those who love it rich and oozy, this might fall short of their expectation. 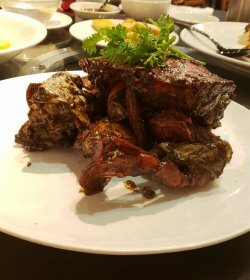 Overall, the food at Red House Seafood wasn't that fantastic but the service was excellent. The staffs were very attentive to welcome us to our seats and even take our orders patiently. My colleague accidentally spilled tea on the floor too and the cleaning staffs were very nice to insist "it's ok" when we tried to help. The cleaning was done quickly to avoid the tea from flowing all over. When we were walking out, all of them greeted us goodbye too. 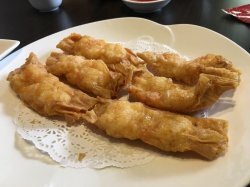 Although the food wasn't up to my expectations, I have to say that their service was impeccable and I would visit Red House Seafood again to try their main courses. A newly opened branch by the famous East Coast Park Red House, my family decided to have a family dinner here, since my mom used to frequent the old red house often. The ambiance of the restaurant is very different from the other branch. It is more "hip" and modern and I guess it's due to the location and wanting the younger crowd to frequent this place. 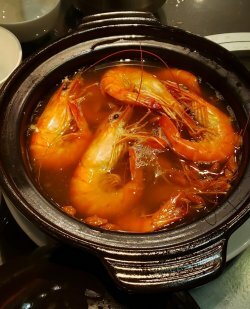 We tried some of the dishes and my favorite is definitely the seafood hot pot in nyonya sauce. 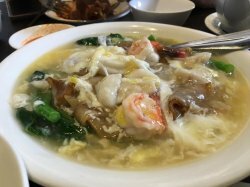 The seafood pot is generously toss in with prawns, scallops, squid and fish. The seafood are so fresh that when you bite, you can actually hear the crunchy sound. The reason why I love this dish is because of the sauce. The spice level is so powerful that it gets addictive. The sauce is the major reason why I had 2 bowls of rice that night because it is so appetizing when you pour the sauce over your rice... You can choose your spicy level though, if you are not a fan of chili but wanting to try this dish, you can request to have the minimum level of spiciness and the chef will cook it up according to your liking!